Kyle Connor scored for a third straight game to help lift the Winnipeg Jets to a 2-1 victory over the Los Angeles Kings on Tuesday. Connor Hellebuyck didn't have to work too hard to earn a win Tuesday night. The Winnipeg Jets goalie only had to make 16 saves in a 2-1 victory over the Los Angeles Kings. "The guys were really good in front of me so I could just enjoy the game," Hellebuyck said. Winnipeg (2-1-0) outshot the Kings 39-17, with Kyle Connor scoring for a third straight game and Mark Scheifele adding the other goal. Connor said he views the goal streak the same way he approaches every game. "Trying not [to get] too high or too low throughout the season," the sophomore winger said. "It's a long season here. But playing with confidence is a big thing for me." Jack Campbell, replacing injured starter Jonathan Quick, stopped 37 shots in his ninth career NHL game. "[Campbell] comes in tough spots and the team doesn't play well in front of you, but he still gives you a chance to get a point at the end of the day so it's terrific," Kings head coach John Stevens said. Ilya Kovalchuk scored his first goal for the Kings (1-1-1) and the 418th of his NHL career. He left the league five years ago to play professionally in Russia, but signed a three-year deal with the Kings in June. The 35-year-old got behind Winnipeg's defencemen, skated to the net and redirected a Drew Doughty pass into the net at 6:26 of the opening period. The Jets tied it up four minutes later when forward Brandon Tanev spun away from a defender along the boards and sent a quick pass to the slot for Scheifele's first goal of the season at 10:59. Winnipeg outshot the visitors 10-4 and had one power play in the first period. 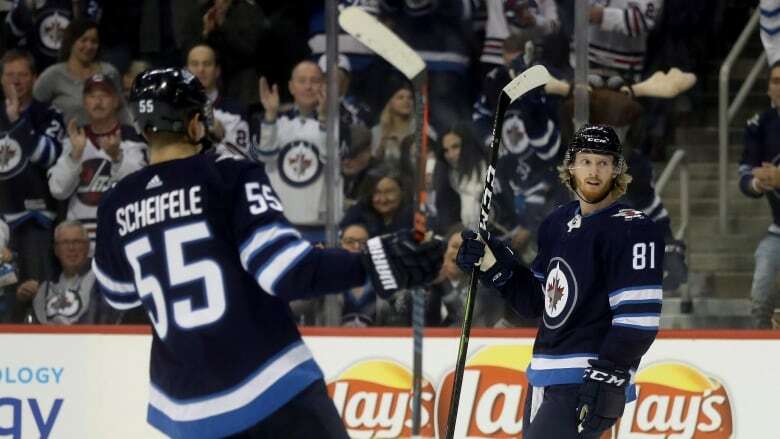 The Jets had almost back-to-back power plays near the midway point of the second period and were successful on the second one when Connor poked the puck in with his stick after a Blake Wheeler shot went off Campbell and began heading toward the goal line at 10:21. Winnipeg defenceman Tyler Myers was called for high-sticking with 3:02 remaining. Campbell went to the bench with about 90 seconds left to make it six on four, but couldn't convert with the advantage. The Jets travel to Nashville for a game Thursday, while the Kings play the second game of their four-game road trip in Montreal the same night.